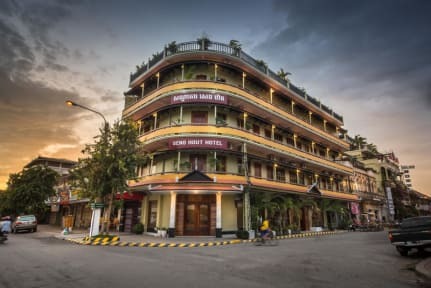 Seng Hout Hotel is located in the heart of Battambang city. 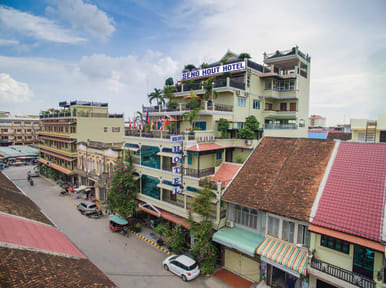 Seng Hout Hotel is in a safe, quiet area close to Psar Nat Market and cafe area. Relax at the hotel after taking in the sights and experiences that Battambang Province has to offer. Watch the spectacular sunsets as you enjoy a drink on the roof top of the hotel with views over the city of the surrounding mountains. Excellent location, amazing value for money. Helpful and friendly staff. Very nice hotel with a great people! I liked so much! Great location for walking around Battambang. Top notch location and room central market is literally across the road. Awesome rooftop pool and area. Would stay again for sure. Very clean hotel right in the center of town. It is a hotel so there isn’t much of an atmosphere but the staff were friendly and helped with setting up onward travel. Location and staff are good. Many mosquitos in the room, cold showers and pool outside refreshing but cold. We stayed here overnight before spending 2 weeks volunteering teaching english at the AKD School. We chose here as the room had aircon. We had an standard private double which was small and had a window to an internal stairwell but the price was good. It supposedly has a cafe, but despite all the lights being on & door being open, we never saw anyone behind the counter. We asked 3 times at reception if we could buy a coffee and they said no each time. Lots of other good cafes around though.